Italian Pastry Cream makes these Italian Peach Cookies, unique and delicious. The perfect way to celebrate a special occasion. 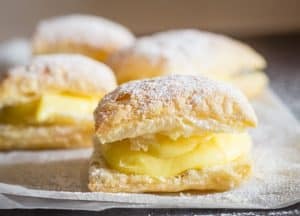 These cute, delicate, full of Italian Pastry Cream Cookies are a favourite in any and every bakery in Italy. Birthdays, Anniversaries, Christmas and every holiday in between are celebrated with a big tray of Pasticcini or Pastries. From regular size to mini, which are my favourite because that way you can have 2 or 3 without looking like you haven’t eaten in a week. Baba al Rhum (Naples) – A soft yeast cake that is saturated in Rum (and I mean saturated)! Bigne con la Panna (cream puffs) – A delicate pasta choux, usually filled with a Chocolate or Vanilla Italian pastry cream. 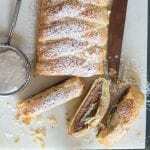 Cannoli (Sicily) – Fried pastry shells usually filled with a Ricotta and chocolate chip filling. Diplomatico (Palermo) – This pastry consists of layers of sugared puff pastry with a middle layer of sponge cake, the filling between the layers is usually a mixture of Italian pastry cream and a chantilly cream. 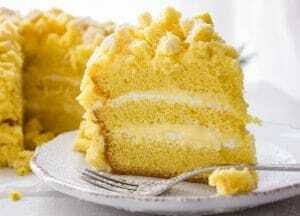 It is a very famous pastry in Italy is sometimes served as a Birthday Cake. Mignon a Tartina (Mini tarts) – Italian pie dough blind baked then filled with Italian pastry cream and topped with fresh fruit. Barchette – (mini boat shaped pastries) – A crunchy buttery pastry usually filled with a creamy hazelnut filling. Sfogliatella (Campania) (Lobster Tail) – Is a shell shaped very crunchy puff pastry and is usually filled with a delicate cream or chocolate filling. My absolute favourite! 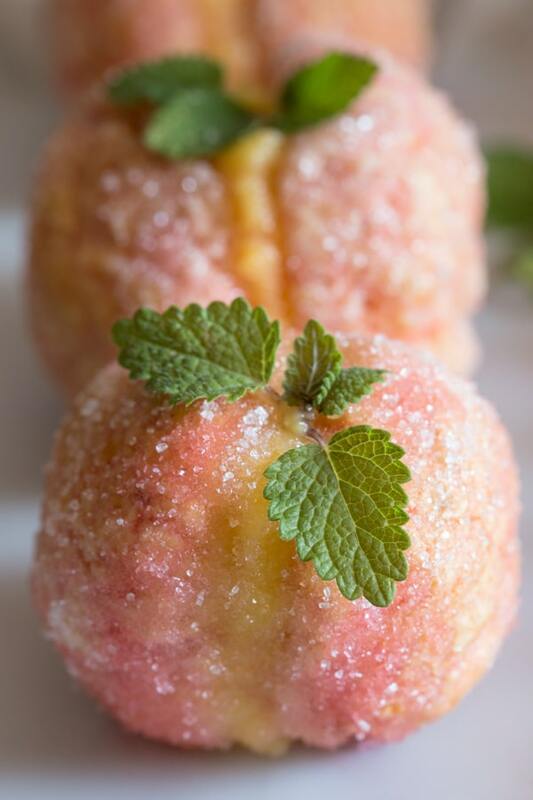 What are Italian Peach Cookies? 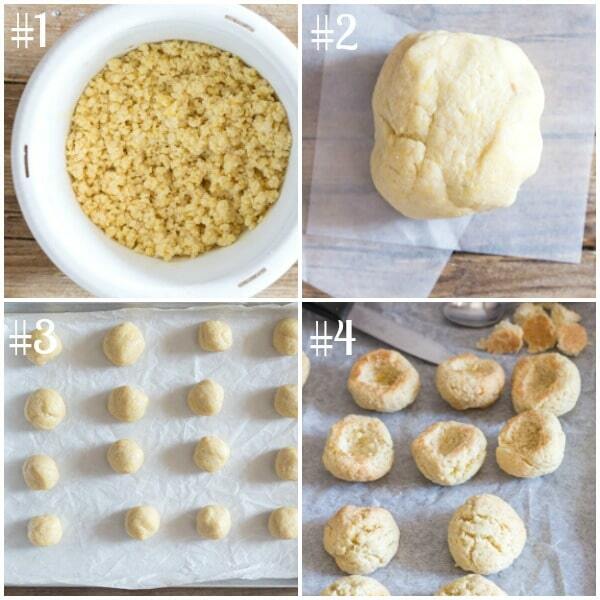 Usually these Peach Cookies are made with a soft cookie dough. The dough is rolled into small balls and baked. Each cookie is then hollowed out and filled with Italian Pastry Cream, then two cookies are attached together. The cookies are then dipped in an Italian liqueur called Alchermes and rolled in sugar. It is a bright red liqueur that is a little syrupy. It tends to have a floral aroma with a sweet, spicy flavour. 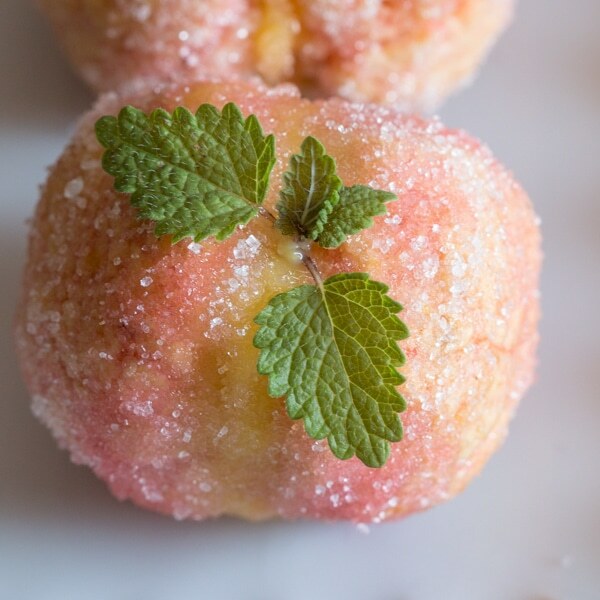 It comes from Tuscany which is also where these Peach Cookies originated. It can be difficult to find Alchermes outside of Italy so a substitute of Red Campari or Peach Liqueur with some red food colouring. Or maybe you have something else in mind? 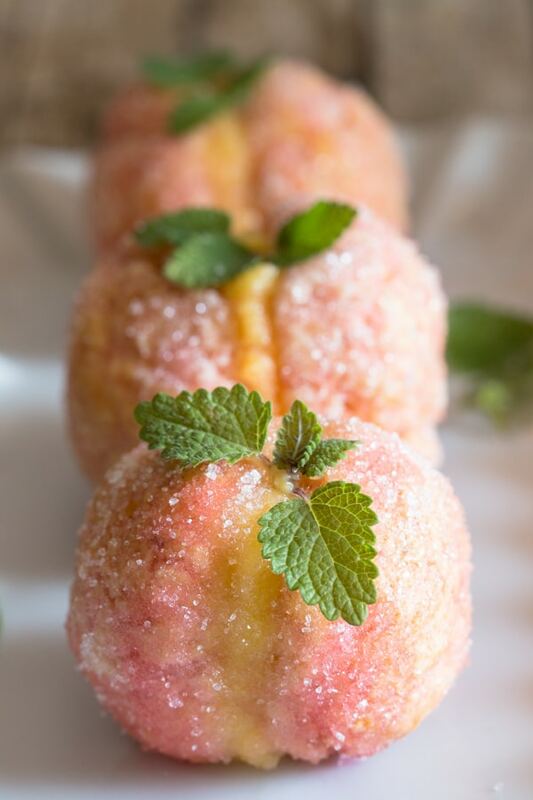 These Italian Peach Cookies are a little crunchier than the Peach Cookies we get in the bakery, not as soggy and dripping with Alchermes as the traditional, and to tell the truth we perferred them this way and I hope you do too. 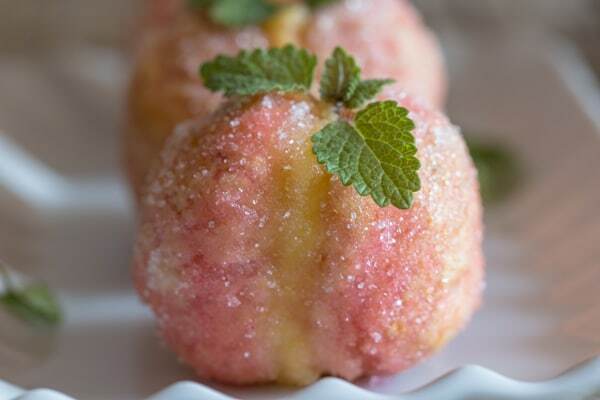 Not only are these Peach Cookies very unique and pretty to look at, they are very delicious too. Enjoy! Italian Pastry Cream and pastry makes these Italian Peach Cookies, unique and delicious. The perfect way to celebrate Summer or a special occasion. Pre-heat oven to 350F (180C). Line one or two cookie sheets with parchment paper. Make the Italian Pastry Cream before you make the cookies, because the cream needs to be refrigerated for approximately 2 hours. 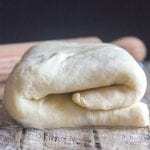 With floured hands roll the dough into 16 balls (try to make them all the same size). Place on parchment paper lined cookie sheets, about one inch apart. Bake for approximately 15-20 minutes. Let the cookies cool enough to be held, then with a sharp small knife remove the middle of the cookie (make a small well / hole). Fill each hole with some cooled Pastry Cream. Place two cookies together to form a circle. 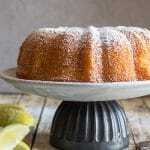 In one bowl place some Alchermes Liqueur or substitute** and another small bowl with some granulated sugar. First dip the cookie in the liqueur (don't let them sit or they will fall apart), place on a wire rack for 30 seconds (if you don't let them sit then the sugar will just all clump together on the cookie) then roll them in the sugar. 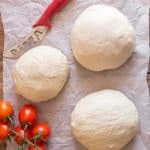 Refrigerate for approximately 30-60 minutes before serving. Enjoy! **Alchermes can be substituted for a peach liqueur with a little red food dye or Red Campari. 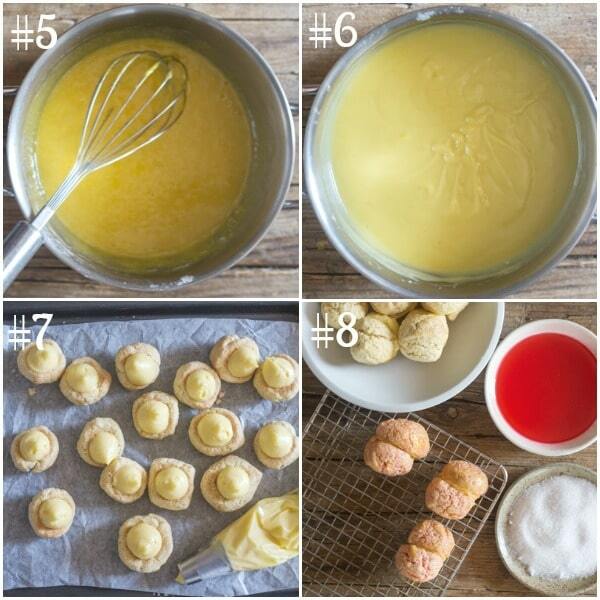 Any extra Pastry Cream can be used to fill just about anything, can keep in the refrigerator for about 2-3 days. 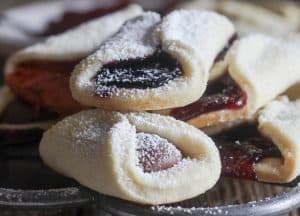 My mother in law use to make these for me and I have been looking for the recipe for the last 20 years. I didn’t know what they were called so I had no idea how to search for them. I am so happy I found them now. Thank you so much for posting these. I could finally make them! Hi Chantal, thanks so much and so glad you found them. I hope you enjoy them. Have a great week. Several years ago, I read John Gresham’s Playing for Pizza. Ah, the food in that book! But it was when I read a mention of black pie, that I said, ‘I have got to figure out how to make it.’ All that was said, was that it’s made with coffee, almonds and chocolate, and apparently it’s from Parma. Hi G.Brumfield sounds very interesting I am now on the look out. Stay tuned. Have a great week. How much zest of lemon? I love your recipes. Hi Shirley, sorry I had that reversed it should be zest of 1/2 a lemon. Thanks and I hope you enjoy these. Have a great weekend.